If this salad were a family’s DNA, everything goes on the platter. The lovely green spinach, the bright Mandarins, the luscious Asian leaning chicken and the slivered almonds for crunch. Then it all gets mixed up. When it’s served out, you might get 50 percent spinach, 30 percent chicken,15 percent Mandarins & 5 percent almonds. But I might get 30 percent spinach, 60 percent chicken, 9 percent Mandarins & 1 percent almonds. I’ll take my plate, thanks! 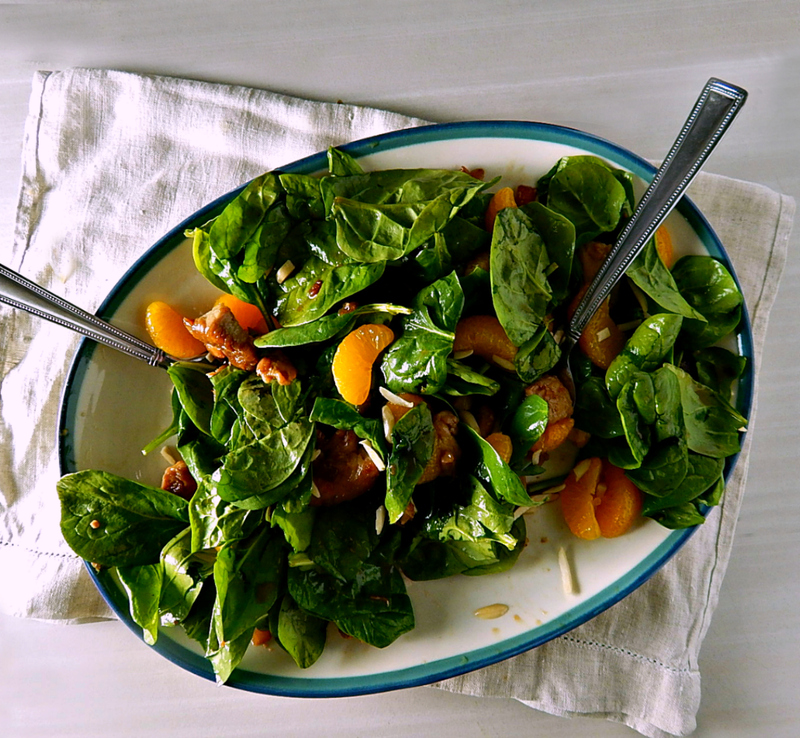 This salad is a beautiful thing: When that warm, rich, Asiany chicken mixture hits those cool spinach and Mandarins, it’s like an explosion of flavors and textures and the warmth just seems to intensify the Mandarins and spinach. This is is a great example of simple, everyday ingredients put together in a way that’s a little unexpected and different. It’s a bit of a surprise. Oh, and the surprise in the DNA? We knew about the French, Scottish, Irish, Dutch & English. It was the 13 percent Scandinavian that blew us away! Who knew? Vikings, maybe? So you can see with DNA like that why I have such a passion for Asian food, right? LOL! But back to the salad. The chicken in this salad has just a nod toward the Asiany side, and it’s a bit surprising how scrumptious it is with just the garlic, ginger and soy for flavor. I rediscovered this recipe when I was looking through my recipe box for that old standard Spinach salad with the warm bacon dressing, hard-boiled eggs, and mushrooms. And since I already ate all the hard-boiled eggs I made the other day (oink oink) I decided to make this Warm Spinach Chicken Mandarin Salad, instead. I was glad I did. I got to use that can of Mandarin oranges languishing in the pantry. I used healthy almonds for the garnish, but this is good with those dry, crunchy chow mein noodles, too. This is a super easy make. Just arrange the spinach and Mandarin oranges on a platter or in a bowl, then pour the chicken mixture over. If you want to go an extra step, toss the spinach with some of the sauce first. Then top it all off with a good sprinkling of the almonds (or chow mein noodles.) Easy peasy. The chicken is easy, too. I love that the ginger and garlic are grated, there’s only a little chopping with the onion, and it comes together, literally in minutes with very little work and even less mess. Ya gotta love that! Always buy chicken on sale; watch the highs and lows in your area so you know a great deal. Break down the bigger family packs, trim the chicken into portion sizes and freeze in packages the right size for your family. Use the trimmings for dishes like this or maybe stir fry meals. It’s getting harder for me to find spinach that’s not already bagged. Buying in those bags usually sets you back 4 to 10 times the amount of buying the spinach loose or bundled. Shocking, right? Check the prices. The bags are usually in odd ounces while the loose is priced in pounds, and I think that’s done purposely to make it hard to compare. Maybe I’m just paranoid? Maybe, but I think those producers knew just what they are doing when they package and market bagged spinach and lettuce. Let’s say your 12-ounce bag of spinach is $2.49. Divide the $2.49 by 12 to figure out how much per ounce: .2075. Multiply that by 16 to get the price per pound: $3.32 a pound. Yikes, right? All loose in the bag there, it looks like a lot of spinach, right? I haven’t compared Costco prices, although I hear they’re good. Ok, well, enjoy the salad! I’m off to look for Scandinavian recipes! The only one I know of on my blog is my marvelous Swedish Meatballs, by way of Tyler Florence. Funny, I mentioned my family history on that post, too! Links are at the bottom of the page. A simple, easy and stunning main dish salad. Arrange spinach and oranges on a platter or in a large, shallow bowl. Heat oil in a medium-sized skillet over medium-high heat. Add the chicken and onions and cook, turning as chicken browns, until chicken is cooked through. Add the ginger and garlic and heat for about a minute. Add the water, soy, honey, and vinegar and stir to bring any browned bits up from the bottom of the pan. Briefly heat, then pour over the spinach and oranges. Toss to coat and sprinkle with almonds or chow mein noodles. If the bottom of the pan is getting too dark and in danger of scorching as the chicken cooks, add the water in a little early, scrape the pan and continue to cook until the chicken is done. This entry was posted in Click here for Bargain Meals, Click here for Fabulous Food Posts and tagged Almonds, Asian, Chicken, Main dish salad, Mandarin Oranges, Salad, Spinach. Bookmark the permalink. Thanks, it’s my pleasure. It’s nice to have something different as the summer wears on. Yum! My husband and I had our DNA done and were disappointed there weren’t any surprises. Almost all English/Irish. We might even be very distantly related. Oh funny! Well, that’s one surprise then, lol! I was stumped at the Scandinavian – but with all the Scottish, Irish and English, I figure it must have come from there. Rhonda, it seems I’m always lagging behind and catching up!! I have some planting I need to do – like this week!!! What you putting In the garden Mollie?? Bet it grows great there with your rain (real weather!!) hugs friend! Agree. Tomatoes are the best reason to plant. xoxox Mollie! Beautiful! I love all of the ingredients. Hi Mimi, and thanks. I love this, simple and easy and the flavors just seem like they’re more complex than they are! Thanks much! It’s such a pretty salad. My mouth literally just watered.😅 I feel that I want to dive in into this salad right now. This is such a delicious salad, Mollie. Thanks for taking this along with you at this week’s Fiesta Friday party! If I weren’t so stuffed from my own supper of leftover meat loaf and guacamole sourdough tortilla wrap I’d want a BIG plate of this delicious looking salad. PS: I’d like to have my DNA done as well as the rest of my family. Thanks much! Sounds like the inventive wrap, lol! Anything with guac! It is so much fun to see the connections growing on the family tree – especially dead ends! And it is a good idea to have everyone tested. So far, we’ve just done Dad.